I am so excited to share this news with you. 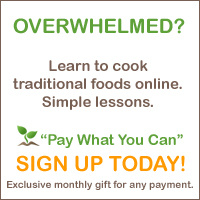 I have been taking an online cooking course through GNOWFGLINS (God’s Natural, Organic, Whole Foods, Grown Local and INSeason). I have really learned so much from the course. Well, from GNOWFGLINS has now decided to offer the course to any and everyone on a donation basis. This means that money doesn’t have to hold you back from learning how to make nourishing, wholesome foods for your family. I have really enjoyed cooking with sourdough, making dairy kefir and my entire family finds water kefir so refreshing on a hot day! I even made my very own cheese last week. I encourage you to check out Wardeh’s class and start introducing your family to these wholesome foods.